Find hotel near Basilique Collegiale Notr .. 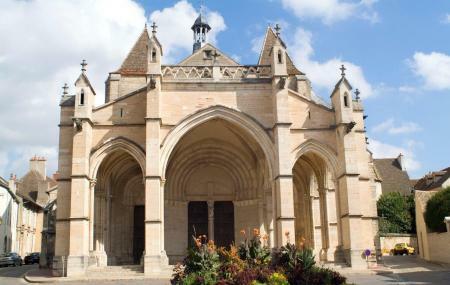 This beautiful cathedral also known as “The Daughter of Cluny” is an excellent example of Burgundian Romanesque architecture. Many elements were later on added to this elegant monument that makes it look like a blend of Gothic and Burgandian styles. It is also included in the List of Historical Monuments since 1840. The 12th Century statue of Virgin Mary inside the Choir Section. The Gothic Spire of the church. How popular is Basilique Collegiale Notre Dame? People normally club together Musee De L'hotel Dieu and Beaune Clock Tower while planning their visit to Basilique Collegiale Notre Dame. Great building and unusual designed church front, take a walk along the side and back to see some extraordinary architecture and building. At the back you will see some great stain glass windows, just amazing building worth the walk around. Impressive building with equally impressive carved doors - amazing. Inside the stained glass windows are superb. Quite pretty and a good place to get out of the heat.